One of the most recognizable cowboy actors by his face and especially his voice, he was a staple in westerns from the 1940s to the 1980s. Tall, burly and rugged looking with a weather-beaten, but handsome, face and intense, leering eyes it was his raspy, flat voice that was his identity. He was born Marlin Davis in Edgerton, Missouri on August 26, 1915 and grew up in the Midwest. He attended William Jewell College in Liberty, Missouri and worked various odd jobs after leaving college. He worked as a tent rigger for a circus, attesting to his rugged image, and later as a salesman for an oil company which brought him to California and Hollywood in the 1930s. It wasn't long before he was "discovered" and offered jobs and auditions and even though he was offered a contract by MGM and appeared in a short as an FBI agent, he joined the Coast Guard for a term of duty. Later he returned to films and found his niche in westerns and as a tough guy. It wasn't until the late 1970s and 1980s where he truly enjoyed fame as a star working in the TV series "Dallas." His film credits include: "Tennessee Johnson" (1942) with Van Heflin, as Reporter, his film debut; "Cairo" (1942) as Sergeant; "Salute to the Marines" (1943) as Saunders; "What Next, Corporal Hargrove?" (1945) as Sgt. Hill; "Gallant Bess" (1946) as Harry; "Merton of the Movies" (1947) uncredited as Assistant Director; "The Fabulous Texan" (1947) as Sam Bass; "Yes Sir That's My Baby" (1949) as Joe Tascarelli; "Hellfire" (1949) as Gyp Stoner; "Brimstone" (1949) as Mick Courteen; "The Savage Horde" (1950) as Lt. Mike Baker; "Silver Canyon" (1951) as Wade McQuarrie; "Little Big Horn" (1951) as Corp. Doan Moylan; "The Big Sky" (1952) with Kirk Douglas, as Streak; "The Outcast" (1954) as Maj. Cosgrave; "Hell's Outpost" (1954) as Sam Horne; "The Last Command" (1955) as Ben Evans; "Monster from Green Hell" (1957) as Dr. Quent Brady; "Duel at Apache Wells" (1957) as Dean Cannary; "Alias Jesse James" (1959) with Bob Hope, as Frank James, a fun role of his; "Iron Angel" (1964) as Sgt. 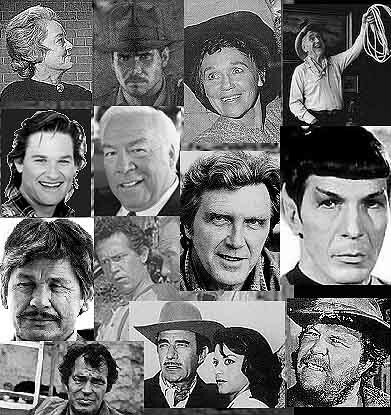 Walsh; "Zebra in the Kitchen" (1965) as Adam Carlyle; "Jesse James Meets Frankenstein's Daughter" (1966) as Marshal MacPhee; "El Dorado" (1967) as Jim Purvis; "Rio Lobo" (1970) with John Wayne, as Riley; "Monte Walsh" (1970) with Lee Marvin, as Cal Brennan; "Dracula vs. Frankenstein" (1971) as Sgt. Martin; "Big Jake" (1971) as Head of Lynching Party; "The Parallax View" (1974) as Sen. Hammond, perhaps his best role and one of my favorites; "The Choirboys" (1977) as Drobeck, another fine role of his; "Comes a Horseman" (1978) as Julie Blocker and "The Day Time Ended" (1980) as Grant, his final theatrical film. On TV he was a regular on: "Stories of the Century" (1954) as Matt Clark; "Rescue 8" (1958-59) as Wes Cameron; "The Cowboys" (1974) as Marshal Bill Winter and "Dallas" (1978-81) as John Ross 'Jock' Ewing. He also appeared in TV movies including: "Hondo and the Apaches" (1967); "The Trackers" (1971); "Deliver Us from Evil" (1973); "Killing Stone" (1978) and "Don't Look Back: The Story of Leroy 'Satchel' Paige" (1981). He guest starred on numerous TV series including: "Cowboy G-Men"; "Yancey Derringer"; "26 Men"; "Wagon Train"; "Gunsmoke"; "Bonanza"; "Perry Mason"; "Rawhide"; "Branded"; "The Time Tunnel"; "Kung Fu"; "The Virginian"; "The F.B.I." and "Cannon." He died of complications of surgery for a gastric ulcer on April 26, 1981 in Northridge, California at the age of 65.